Activists question whether the sheriff's office violated the county's sanctuary law. The sheriff said ICE may not come back to Urban Shield in 2018. 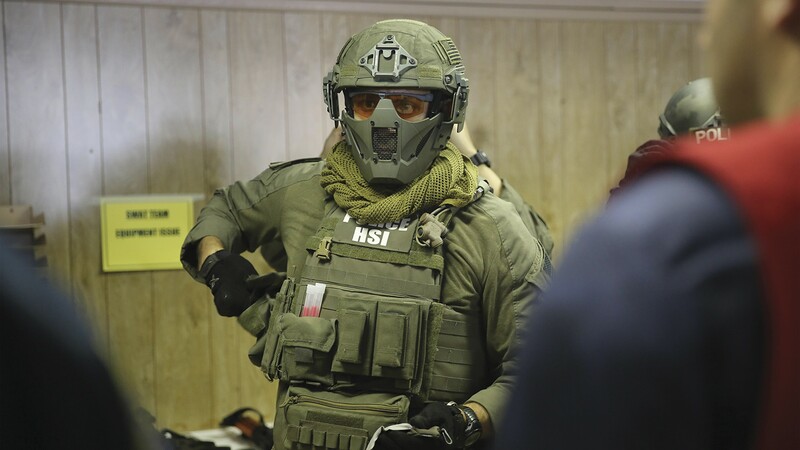 Last September, officers from Homeland Security Investigations (HSI) — the investigative arm of Immigration and Customs Enforcement (ICE) — participated in Urban Shield, a controversial weekend-long SWAT training exercise and military equipment exposition organized and hosted by the Alameda County Sheriff's Office. Recently released photographs show HSI officers taking part in the counterterrorism simulations. They depict uniformed officers standing over fake gore-spattered actors and dummies, carrying off volunteers dressed as victims or combatants and approaching an unseen combatant with weapons raised. Sheriff's spokesperson Sgt. Ray Kelly also confirmed that HSI's tactical team participated in last year's Urban Shield event. The fact that HSI/ICE is being trained at an event put on by the sheriff's office, some community and social justice activists say, is at odds with the county's sanctuary policy. "I think the principalities that have passed sanctuary ordinances shouldn't be doing anything to assist ICE, and that includes training their special response team as part of Urban Shield," said Mike Katz-Lacabe, a member of local surveillance and law enforcement watchdog group Oakland Privacy. Katz-Lacabe, who also founded the surveillance watchdog Center for Human Rights and Privacy, obtained the photos of HSI/ICE participating in Urban Shield from the Alameda County Sheriff's Office through a California Public Records Act Request. The controversy surrounding operations by HSI and ICE has intensified over the past year after President Trump ordered crackdowns on undocumented immigrants nationwide. Last week, ICE officials said they arrested 150 people during Bay Area sweeps and would have captured hundreds more if Oakland Mayor Libby Schaaf had not warned undocumented immigrants and the public about ICE's plans. Many Bay Area community members have also voiced opposition to cooperation between the federal agency and local law enforcement, arguing that it violates the sanctuary policies. Established in 2007 by the Alameda County Sheriff's Office, Urban Shield is a two-day competitive simulation and military equipment exposition hosted in Pleasanton. It attracts law enforcement and military agencies from all over the globe, including Israel, Mexico, and Bahrain. Urban Shield bills itself as a counterterrorism event, and supporters say it readies law enforcement and military to respond to particularly extraordinary or high-stakes scenarios. Alameda County Sheriff Gregory Ahern told the county board of supervisors last week that the department created Urban Shield in order to better prepare for emergency situations. Much of the debate at the board of supervisors meeting surrounded whether too much focus was being put on counterterrorism training and whether disaster preparedness training could be achieved by other means. The photos of HSI/ICE officials participating in last year's Urban Shield were presented to the board of supervisors by Tracy Rosenberg of Oakland Privacy. Rosenberg noted that HSI/ICE was not listed on the Urban Shield website as a participant or sponsoring organization. "It looks to me like basically they didn't let that out because they knew what the reaction would be," Rosenberg said. The board of supervisors voted to approve a list of recommendations provided by the Urban Shield Task force, a committee that was established in 2017, in response to community protests and calls to disband or reform Urban Shield. Some recommendations included ensuring that Urban Shield will be "free from racist stereotyping" and that reports on emergency preparedness activities be made public. The board also required the sheriff to issue a report prior to receiving further funding for Urban Shield to specify how he is implementing the recommendations. Urban Shield's website lists 317 supporting agencies, including the Oakland Police Department and the Alameda County Fire Department, Oakland City Libraries, East Bay Municipal Utilities District, and several branches of the Department of Homeland Security, including its Science and Technology Branch and its Domestic Nuclear Detection Office. California did not become a sanctuary state officially until a month after last year's Urban Shield expo, but Alameda County has been a designated sanctuary county since 2014, and the board of supervisors reaffirmed its status in 2015 and 2017. Urban Shield was held in Oakland until 2014, when community activists fought to have it moved. In January, the Oakland City Council unanimously passed a resolution forbidding OPD from cooperating in any way with ICE, but the Oakland Police Department is listed as a supporting agency for Urban Shield. OPD officials did not respond to a request for comment for this report. Sgt. Kelly said HSI's desire to participate in the training program was not unique and that most law enforcement agencies want to participate in Urban Shield. "It's basically the Super Bowl of [law enforcement] training," he said. "You want to come because you're going to train and compete against the best teams in the world." He also said that HSI's participation in Urban Shield is not an endorsement of ICE by the sheriff's office. Kelly noted that HSI's primary responsibility is not immigration enforcement. Instead, it mainly runs investigations of immigrants allegedly involved in crime. "It's easy to look at it this way: The Department of Homeland Security equals ICE equals training at Urban Shield equals terrorizing communities," he said. "It's a lot more complex than that." However, it was an HSI operation involving immigrants that prompted Oakland to sever all ties with HSI. Last August, Oakland police provided support during a controversial HSI raid in West Oakland. HSI officials maintained that it was a criminal human trafficking operation, but the only person detained in the raid was arrested solely on an alleged immigration violation. The operation sparked a backlash, prompting the city council and Mayor Schaaf to bar OPD from ever helping HSI again.